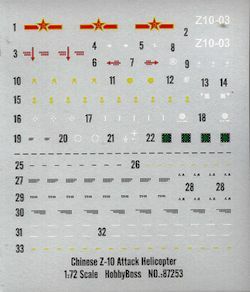 The WZ-10 (WZ, 武直 = Wuzhuang Zhishengji, 武装直升机, literally "Armed Helicopter") is an attack helicopter developed by the People's Republic of China. It is designed primarily for anti-tank missions but is believed to have a secondary air-to-air capability as well. It is being built by Changhe Aircraft Industries Corporation (CAIC). In 1998, the 602nd Research Institute proposed to either separate the armed helicopter program from the medium helicopter program, or devote all resources to the armed helicopter program. The 602nd Research Institute's called its proposed armed helicopter design the WZ-10 (Wu Zhi (武直)-10), with some sources outside of China calling it the Z-X armed helicopter. As a result, most of the resource went to the WZ-10, although the medium helicopter program continued with reduced priority; the medium helicopter could continue to develop technology used by both military and civilian aircraft. The WZ-10 program was called the Special Armed Project (专武工程), a short form for Special Use Armed Helicopter Project (专用武装直升机工程). Development was kept under stricter secrecy than the Chengdu J-10 fighter. Nearly ¥ 4 billion was initially invested and the WZ-1- became one of the most important programs begun in the 9th 5-yr plan. The 602nd Research Institute was assigned as the chief designer, while Harbin Aircraft Manufacturing Corporation (HAMC) of China Aviation Industry Corporation II (AVIC II) was assigned as the primary manufacturer. Nearly four dozen other establishments participated in the program. In the summer of 1999, AVIC II began to use a CAMC Z-8 to test newly developed WZ-10 sub-systems. In autumn of the same year, a Harbin Z-9 was added to the test aircraft inventory. These tests concentrated on sub-systems such as the fire-control systems, HOTAS controls and navigation systems. South Africa provided limited help in the area of flight stability based on experience from designing the Denel AH-2 Rooivalk. South African assistance ceased in 2001. In 2000, the Chinese again attempted to obtain a Russian attack helicopter, but the deal for the Kamov Ka-50 fell apart just as the Mil Mi-28 deal several years earlier. 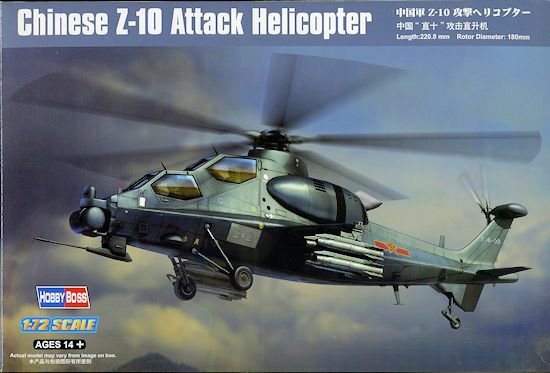 The repeated failures in obtaining foreign attack helicopters reinforced feelings that China had no choice but to ignore foreign options and develop its own such aircraft and work on the WZ-10 accelerated. In the same year, HAMC transferred most of its production responsibilities to CAIC of AVIC II. The official reason given was excessive workload; HAMC was busy producing the HC120 and Harbin Z-9, as well as other fixed-wing aircraft such as the Harbin Y-12, and thus was stretched to the limit. However, many speculated that HAMC was not performing well enough due to rigid and ineffective Soviet-style management practices, believed to have caused the company to go into debt. Although HAMC was in the process of reform, which finally succeeded, the government and military were weary and impatient. The SH-5 factory had become very profitable after its successful restructuring and reform, but it had to get out of the aircraft manufacturing business for good, manufacturing pressurized tanks and other specialized containers. It was decided that the WZ-10 program was too important to be run by HAMC, so a more stable contractor was sought and CAIC was selected. HAMC still retained responsibility for production of certain sub-systems and components, for which it could utilize experience gained from manufacturing parts for foreign helicopters and fixed-wing aircraft such as the Embraer ERJ 145 family. In May 2002, the WZ-10 tail rotor and some other components were tested on the ground by the 602nd Research Institute. In April 2003, a WZ-10 prototype completed its maiden flight at Lumeng (吕蒙) airfield, the airfield having been assigned to CAIC for such use. According to Chinese sources, the initial test flights were concluded on December 17, 2003, whereas according to other sources they were completed nine month earlier in March 2003. According to Jane's Information Group, a total of 3 prototypes had completed over 400 hours of test flights by this time. By 2004 3 more prototypes were built, for a total of 6, and a second stage of test flights were concluded on December 15, 2004. In one of the test flights the future commander-in-chief of the People's Liberation Army Ground Force Air Force (PLAGAF), Song Xiangsheng (宋湘生), was on board the prototype. A third stage of intensive test flights followed, taking place during both day and night. By January 2006 weaponry and sensor tests, including firing of live ammunition, were taking place. Prototypes and a small number of pre-production aircraft are in service with the Chinese military for evaluation. The design is undergoing continuous minor modification and upgrade based on the feedback. In June 2012, United States charged United Technologies and two of its subsidiaries, Pratt & Whitney Canada and Hamilton Sundstrand, with selling China software that provides the necessary engine codes to operate the CAIC WZ-10. While the Chinese defence ministry denied that China bought or used the software, Pratt & Whitney Canada and Hamilton Sundstrand agreed to pay more than $75 million to the U.S. government to settle the charges. Molded in light grey, this is typical of Hobby Boss' new kits in that the molding is excellent and it is free from the usual molding glitches like inappropriate ejector pin marks, sink areas or flash. The cockpit builds up nicely with seats, control sticks, and instrument panels. There are decals for the main instrument panels and the seats have molded in harness detail. One builds up the initial rotor assembly and the main gun with nose sensor assembly before putting the fuselage halves together. For atop the nose there are to different sensors to choose from, both appearing to be some sort of FLIR. The clear cockpit comes with separate pilot and gunner panels and while they could be posed open, the instructions show them closed. Both the main and tail rotor assemblies are well done and again, there is a option, this time for the dome atop the central rotor hub. As you may expect, this one comes with a lot of weapons. Two full sprues of them and there are options. Two types of missiles are provided, both on quadruple launchers for each side. One set looks like anti-tank missiles while the other set is much slimmer and reminds me of a Sidewinder. The two rocket pods are a smaller tube type 9 rocket assembly with a larger rectangular 4 rocket launcher. These can be mixed as you wish. They fit on short stub wings. 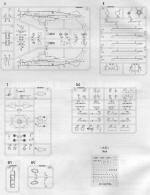 The kit has long wire antenna posts and the builder will need to stretch some sprue or use light wire to duplicate this feature. 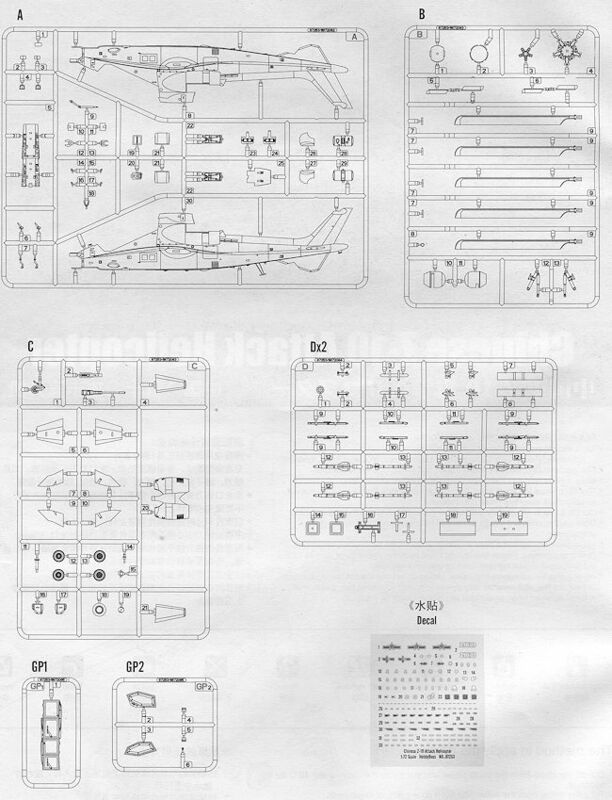 Instructions are well done with only cockpit painting information provided (dark grey with black panels). A full color exterior painting and markings guide is supplied that offers several brand options on what is essentially an all black helicopter. The decal sheet is nicely printed and provides markings for a single example. It also includes data markings for the missiles and pods. I have darkened the sheet a bit so you can see the white parts. As this helo is still in the testing stages, it will be interesting to see what the final production version looks like. I would assume it to be very much like this one, which looks like a combination of the Apache and the cancelled AH-66. It is a very nice kit and should make into a very cool helo for your display shelves.